1% MC History from Texas Biker Radio on Vimeo. In total, 50-60 bikers were treated for injuries at the local hospital. About the same number were arrested. They were charged with misdemeanors: public drunkenness, disorderly conduct, and reckless driving. Most were held for only a few hours. No one was killed or raped; there was no destruction of property, no arson, or looting; in fact, no locals suffered any harm at all. Ironically, the sensational media coverage of Hollister helped to spawn truly criminal 'outlaw' bike gangs. Once the public fear of motorcyclists reached a fever pitch, bikes held irresistible appeal for genuine sociopaths. A few predators formed clubs, and were egged on by wildly-exaggerated media portrayals of biker crime. By the 1960's, clubs like the Hell's Angels made Marlon Brando look like, well, Marlon Brando. The A.M.A. has been fighting a public relations rearguard action ever since. The motorcycles were parked on the streets like sardines! I couldn't believe how pretty some of them were.It was great for our business; it gave us the money we needed to pay our debts, and our taxes. they all paid for their rooms, their food, their drinks. Gil Armas still rides a 1947 Harley 'Knucklehead'. He competed in dirt track events, and later sponsored a number of speedway riders. "Back then, I was a hod carrier; I worked for a plastering outfit in L.A.. I had a '36 Harley, and rode with the Boozefighters. We used to hang out at the 'All American' bar at Firestone and Central. Lots of motorcycle clubs hung out there, including the 13 Rebels, and the Jackrabbits. On Sunday, the cops came back with riot guns, and told us all to pack up and leave. At first, we just sat on the curb and laughed at them, because there was no riot going on, but we all left anyway. In those days, if you rode a motorcycle, then anybody that rode a motorcycle was your buddy. We (Boozefighters) were just into throwing parties." Gus Deserpa lived in Hollister. He is the smiling young man seen in the background of the famous 'Life Magazine' photo. "I was projectionist by trade. I worked at the Granada Theater, which was on the corner of Seventh and San Benito. I would have got off work around 11 p.m.. My wife came to pick me up, and we decided to walk up Main Street to see what was going on.I saw two guys scraping all these bottles together, that had been lying in the street. Then they positioned a motorcycle in the middle of the pile. After a while this drunk guy comes staggering out of the bar, and they got him to sit on the motorcycle, and started to take his picture. I thought 'That isn't right', and I got around against the wall, where I'd be in the picture, thinking that they wouldn't take it if someone else was in there. But they did anyway. A few days later the papers came out and I was right there in the background.They weren't doing anything bad, just riding up and down whooping and hollering; not really doing any harm at all." Harry Hill is a retired Colonel, USAF. He was in visiting his parents in Hollister during the 1947 riots. "I was in the Service then, but I was home for the long weekend. Hollister was a farming community back then. The population was about 4,500 or so. Now it's a bedroom community for Silicon Valley, and the population is about 20,000. I liked motorcycles; I started riding in about 1930, and at different times had both Harleys and Indians. 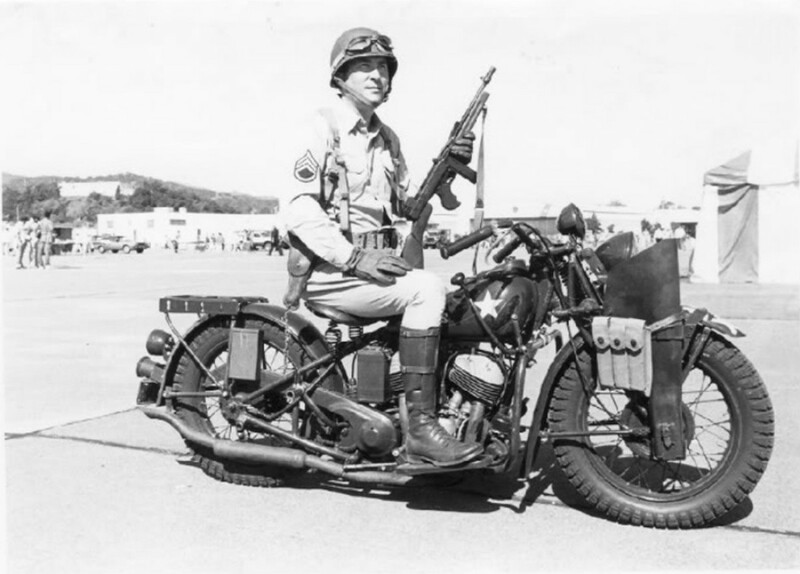 I stopped riding when I enlisted in the Air Force, in about '41, so my bikes were old 'tank shift' types.Back then, the race weekend wasn't necessarily the biggest thing in town, but it was as big as the rodeo, or the saddle horse show. It seems to me that there were always two or three people killed during those weekends; people racing, and riding drunk, but things changed after the war; they got a lot rowdier. On Sunday, I took a look around. It was a mess, but there was no real evidence of any physical damage; no fires, or anything like that. There seemed to a be a lot more drinking going on when the motorcycle boys were in town, than when the cowboys were in town. When the motorcycle boys got rowdy, we used to say 'Turn the cowboys loose on 'em!'. "I was a Boozefighter. The Boozefighters were formed a year or so earlier. Wino Willie had been a member of the Compton Roughriders. They had gone to an AMA race, a dirt track, in San Diego. In between heats, Willie, he'd been drinking, of course, started up his bike and rode a few laps around the track, just for laughs. Eventually they got him flagged off. The Roughriders sort of kicked him out of the club for that; they felt he had embarrassed them. The name Boozefighters was misleading, we didn't do any fighting at all. It was hard to get in; you had to come to five meetings, then there was a vote, and if you got one blackball, you were out. We wore green and white sweaters with a beer bottle on the front and 'Boozefighters' on the back. Back then, I was 23 or 24 I guess, I had just come out of the Air Force. I'd been in the Pacific, but Willie and some of the others had been paratroopers over in Europe. They'd had it pretty rough in the war. I had an Indian Scout, and a Harley '45 that I used as a messenger. Back then, the AMA organized these 'Gypsy Tours'. One was going up to Hollister on the Independence Day weekend. That sounded good, so a bunch of us decided to ride up there. John Lomanto owned a farm a few miles from Hollister. He was an avid motorcyclist, and a well-known local racer. "I worked with my father on our farm, which was just a few miles from Hollister. We grew walnuts, apricots, and prunes. 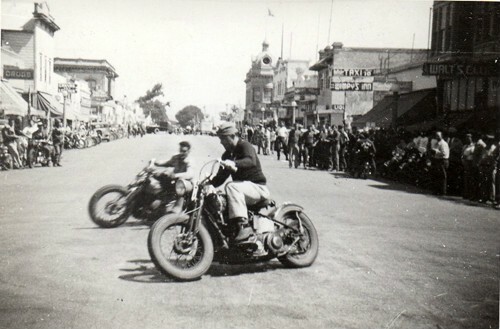 I had a '41 Harley, and was one of the original members of the Hollister Top Hatters Motorcycle Club. In fact, the first few meetings were held in one of our barns, but later on we rented a clubhouse in downtown Hollister. We met three times month. We were a real club, with a President, a Secretary, a Treasurer, and all that. Our wives came, too. Our uniform was a yellow sweater with red sleeves. There were a few races going on that weekend; I think there was a 1/2 mile race, and a TT. I didn't go to the races, but I rode my bike downtown. It was pretty exciting. The main street was blocked off, and the whole town was motorcycles all over the place. Everybody had a beer in their hand; I can't say there weren't a few drunks! But there was no real fighting.